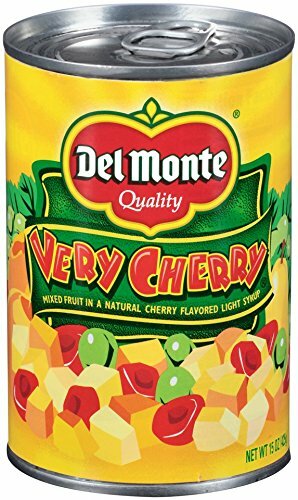 Del Monte Very Cherry Mixed Fruit is a mix of sun-sweetened goodness picked and packed at the peak of ripeness. Featuring a tasty, preservative-free blend of peaches, pears and plenty of cherries in naturally-flavored cherry light syrup, this delicious fruit is a tasty topping for yogurt, cereal, salads and more! Combine with your favorite flavored gelatin for a fun and festive treat. For a tasty dessert, top with crumbled chocolate cream-filled cookies. Also makes a colorful and refreshing fruit topping for ice cream or frozen yogurt! Del Monte works hard to cultivate the freshest, most nutritious fruits and vegetable to use in every one of our products. When you trust Del Monte, you can be sure what you're buying is the peak of quality and nutrition!